Special offer : Afternoon tea with bubbly for guests arriving in April or May 2019! June is a jewel of a month in the lovely Languedoc - Last Chance! 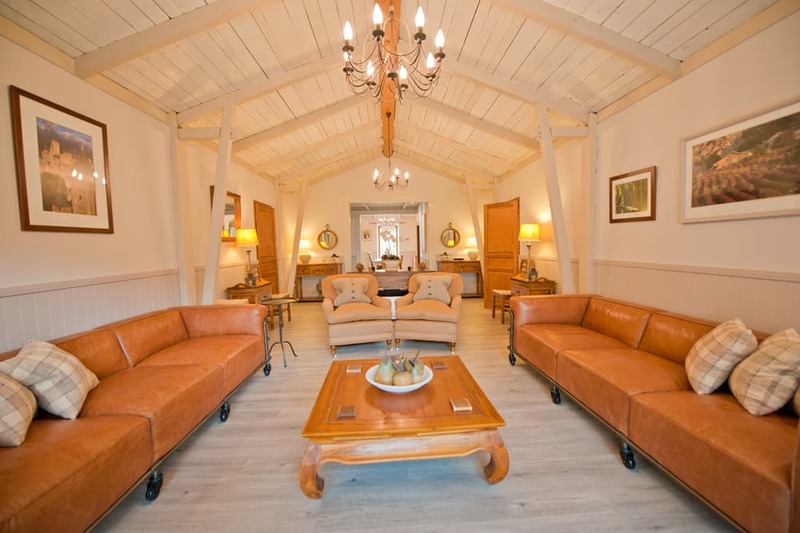 Book the Loft for one week arriving on 1 June 2019 and enjoy a whopping 15% discount off published rates. This is the last week this summer, so don't delay, book today. Fully renovated, former wine-maker's traditional property situated in the pretty town of Rieux-Minervois, 20 minutes from Carcassonne. Great location with all amenities within easy walking distance, including restaurants, café bars and shops. Large supermarket 1 minute drive. All accommodation on the first floor with fully-equipped kitchen, living room with UK TV and Wi-Fi, three bedrooms, all with ensuite bathrooms. Charming, elevated terrace with dining table and seating area. 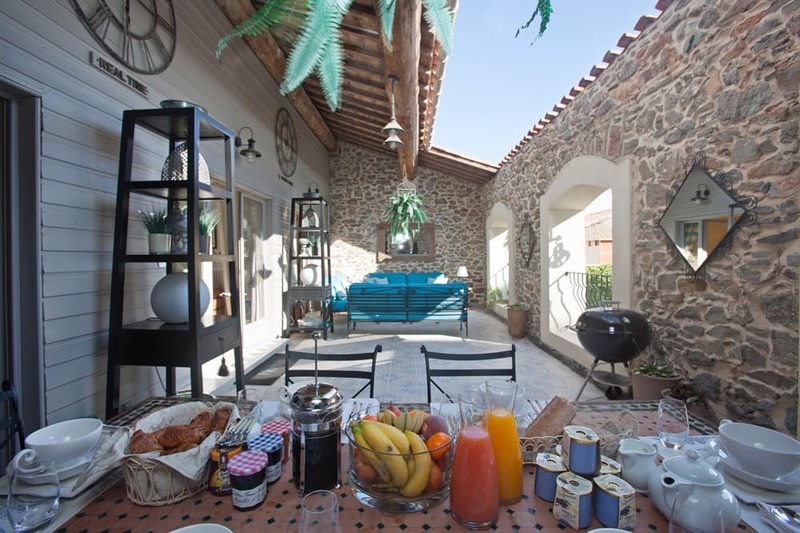 Steps lead down to the walled courtyard with private pool 11m x 4.5m and sun terrace with loungers. Pool-side, shaded dining area and WC. Carcassonne, 20 minutes, (included in UNESCO's World Heritage Sites) has many attractions with its fairy tale turrets and ramparts and the Minervois itself has a history dating back 2,000 years. The property is ideally placed between the Canal du Midi, the Montagnes Noires and the Corbières. Cathar castles, including Les Châteaux de Lastours, and other beautiful medieval villages, such as Minerve and Lagrasse, are all within easy reach of Rieux-Minervois. For those guests wishing to visit the Mediterranean coast and its beaches the region's coastal towns of Narbonne, Agde and Sète can be easily reached as can the Camargue, the Pyrénées and Catalan Spain. Cathar sites of interest, especially those at Carcassonne, Béziers and the village of Minerve offer rich cultural experiences and breath-taking scenery. Kitchen with fridge freezer, microwave, oven and hob and dishwasher. Washing machine. Living room with TV with UK free-view channels and DVD. Wi-Fi internet. Bedroom 2, king size double with ensuite WC, bath, separate shower, hand basin. Bedroom 3, king size double with ensuite WC, bath, separate shower, hand basin. Note; two extra divan single beds available on request. Baby equipment available; Soft-side 1.2m cot. Highchair. Nid / Nest by Babymoov. Combi changing / bathing unit. Pool-side playpen. 1st floor terrace with views over the garden. Dining table and chairs. BBQ. Seating area with sofas and chairs. Steps down to the garden. 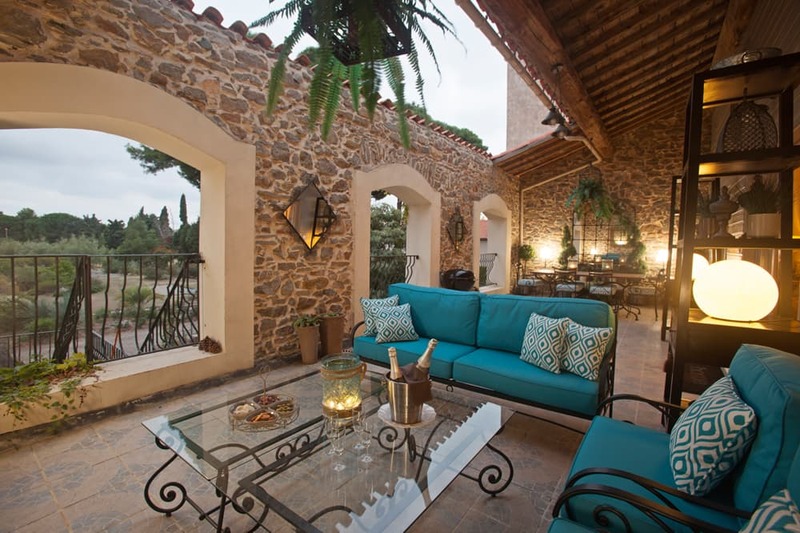 Courtyard with private pool 11m x 4.5m with sun terrace and loungers. Covered dining terrace with table and chairs and BBQ area. WC. Special offer Afternoon tea with bubbly for guests arriving in April or May 2019! Sterling & US Dollar rates are provided only as a guide. * Rentals are payable in Euros. Prices are for the rental of the entire property above, per week. Bookings run from Saturday 4:00pm to Saturday 10:00am. Neither Pure France nor the property owner are liable for any loss or interruption of internet service. Bookings include electricity, water, heating, linen, towels and pool towels (not beach towels). Pool open from May until October. Village school nearby; whilst peak season bookings will be in the school holidays there may be holiday clubs. In shoulder periods (term time) there can be some distant noise of children playing. Holiday reservations at The Loft du Vigneron, in partnership Pure France. Pure France is a specialist agency for holiday rental homes in France, with over 17 years experience. The Pure France team are all personally familiar with the accommodation and facilities on offer at The Loft du Vigneron and can answer any questions you may have, from early to late, 7 days a week. For your peace of mind, all reservations at The Loft du Vigneron are secured and backed by the industry leading systems put in place by Pure France, including full PayPal, Visa and MasterCard payment facilities. © Atkins & Jones, all rights reserved.